Saint Gallen  (St. Gallen, German: Sankt Gallen) is in Switzerland. Alternative airports are the St. Gallen-Altenrhein Airport  (with connections to Vienna) and the Bodensee-Airport Friedrichshafen . St. Gallen is a major hub for northeastern Switzerland. Trains between St. Gallen and Zurich depart twice an hour with a travel time of 1h10min. 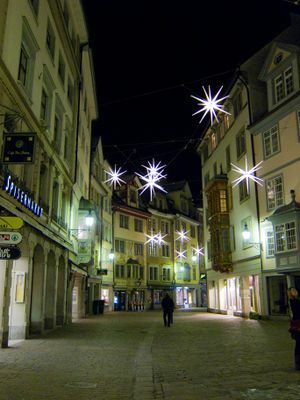 The St. Gallen train station is 500m from the old town and is surrounded by numerous hotels, restaurants, and shops. If you want to get quickly to Munich, 3 times a day the Eurocity from Zurich stops at Saint Gallen. The main train station also acts as terminus for a number of local train lines running to Appenzell and Trogen. Outside the main train station is a central hub for bus and Postbuses  to get around St.Gallen and to surrounding smaller villages. The old town of St. Gallen is almost devoid of traffic and is therefore best enjoyed on foot. The VBSG buses  connect to the fringes of the city and run frequently and punctually. Bus tickets can be purchased at major bus stops or on the bus from the onboard vending machine. Standard fare is CHF 2.50 and is valid for one direction only. Taxis are always waiting at the train station and along the Marktplatz in the old town. The Trogenerbahn  is your connection from St. Gallen to great hiking trails in Speicher and Trogen. Bike rental is available at the train station, but check the opening hours before planning a trip. Parking is available underground in the Migros shopping center garage, near the train station. The garage is spacious and safe but like many things in Switzerland it closes on Sunday. The St. Gallen Stiftsbibliothek , in the Abbey of St. Gallen , is St. Gallen's most famous tourist attraction. The Stiftsbibliothek contains many books dating back from the early Medieval times, and the library itself is a stunning piece of baroque architecture. Textilmuseum  which displays St. Gallen's rich history as a center for textile production and design. If you are interested in beer, visit St. Gallen's local brewery, Schutzengarten . Schutzengarten also hosts a beer bottle museum and a restaurant next door to the brewery itself. On top of the northern hill at Rotmonten there is the Peter und Paul Wildlife park . On the top of the southern hill there are three little lakes called "die drei Weihern". In the summer you can swim there and you also have a nice view over the city. It is an excellent place to jog or simply spend an afternoon. At the eastern corner of the city you can find the Botanical Garden  which houses over 8000 plants. In August there is the Inline one-eleven, 111km Inlining Marathon. The area between the Bahnhof and Old Town is Marktplatz the main street of a collection of pedestrian-only streets filled with shops. Within the area, there are numerous shoe stores, tea shops, coffee houses, perfumeries, and mainstream clothes stores like H&M. While the weather is nice, there are occasionally flea markets set up along the streets of Old Town, just a few streets away from the Abbey. If you happen to be lucky and catch a glimpse of some tents, check them out. There are some surprisingly good deals and treasures. Nothing can be more St. Gallen than the OLMA bratwurst. You can get a juicy OLMA bratwurst, served with a hard roll, at a number of street stands around Marktplatz and around the entire city. St. Gallen has its own brewery that makes at least two beers that are definitely worth a try. These are the "St. Galler Klosterbräu" and the "Schwarzer Bär". Rorschach is about 10km to the northeast direct at the Lake of Konstanz. Check it out for the lake and nice promenade. In august there is the international sand-sculpturing contest . From Rorschach to Kreuzlingen you have a nice 40km route for biking and inlining. South of St.Gallen is the Canton and Town of Appenzell and the Alpstein mountain range. This area of green pastures, steep wooded valleys, pretty farm buildings with a stunning mountain backdrop is picturesque and, apart from the town of Appenzell itself, little visited by tourists. The Alpstein range provides some spectacular mountain walks and is well served with mountain huts and cable cars. This page was last edited on 2 February 2017, at 12:00.